Its been over six months from my last blog post, so it was about time to catch up. I have now been working with the Landestheater Salzburg for almost six months, and while I am really loving it, a lot has changed. The Landestheater Salzburg is a beautiful theater built in 1892 situated in the city center. It is a small house, with 340 employees against the 780 I was used to in Karlsruhe, but while the house is considerably smaller in size, it does not lack in quality and structure. In 2017, the Landestheater built a new rehearsal center. With many practice stages, two big ballet studios and a beautiful view, going to work every morning is extremely enjoyable. We also have worked on six different productions in the last six months, three of them completely new creations. Not bad for a company of eighteen dancers. We started the season with the revival of “Der Fall M”, a ballet I had the honor to dance when it was created in 2014 by Reginaldo Oliveira. “Der Fall M” was revived on the 26th of October as a part of the production “Dionysien” at the unbelievable Felsenreitschule theater (this production deserves its own blog post). “Dionysien” was a very big production involving three different sections of the house: Ballet, Opera and Theater. and was accompanied by the world class Mozarteum Orchestra. As the Landestheater doesn’t have their own Orchestra we have the luxury of using the Mozarteum Orchestra for the productions that require live music. The Mozarteum was founded in 1841 under the auspices of Mozart’s widow Constance, and his two sons. The Orchestra was awarded the Gold Mozart Medal in January 2016, and is considered the cultural ambassador for Mozart’s native town: Salzburg. “Dionysien” was a big success, and in my opinion the best way to start our work here, and after a sold out run of eight shows we were off to start learning nutcracker. Nutcracker was created by Peter Breuer and premiered in 2014, it was special because it was my very first time working at the Landestheater. As I said before, its a beautiful house and although its a little small with an audience of 707 seats, nothing beats the atmosphere of dancing in a beautiful traditional theater. Nutcracker was also the first time I have had a role that consisted of almost all acting and very little dancing (there will also be a post coming up on that). Needless to say, Nutcracker being Nutcracker was also a success, with a short lived, but sold out, five show run. In between “Nutcracker” and “Dionysien” we had the revival of the opera “The sound of Music”, that I had to learn, but didn’t get to dance just yet, and the creation of “Dr Doolitle”, a very fun musical. This season was also the very first time I had to work on New Years Eve, the “Sylvester Concert” is a traditional concert played by The Mozarteum Orchestra at the Großes Festspielhaus, and we had the honor to premiere three new choreographs by Reginaldo Oliveira. Built in 1956, the Große Festspielhaus has a Capacity of 2179 seats, and I am sorry for bragging, but once again we had the delight to dance to a full house. The fact that all three numbers were created only for this evening made it very special, but I could not fail to mention the amount of work involved, many of us were rehearsing three productions a day by this time, and being a small company we often had to share the dancers between studios, and many times rehearse without a full cast. With new years fireworks popped and watched, it was time to concentrate on our upcoming premiere, “The Rhinoceros”. 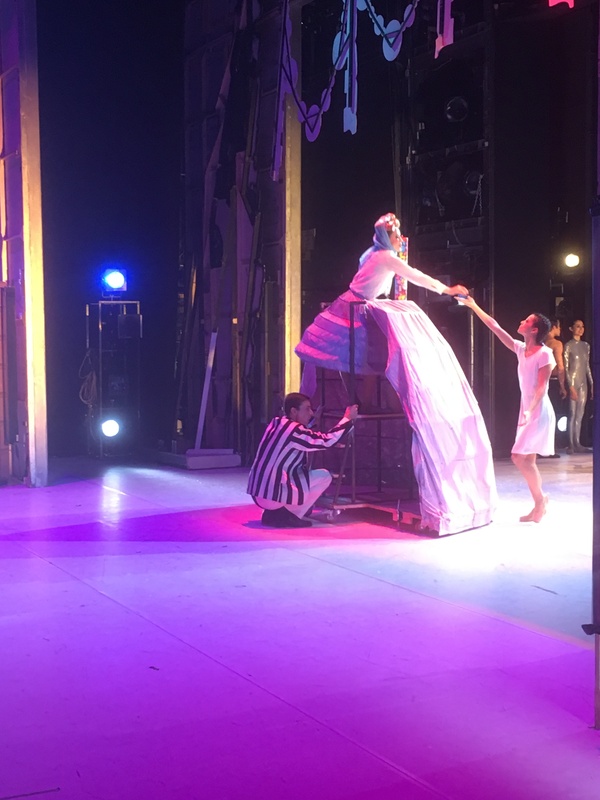 Based on the book by Eugene Ionescu, Rhinoceros is a one hour production choreographed by Alexander Korobko, Kate Watson and Joseph Vesely. I have a soft spot for this production because it has been created to be performed to school classes between the ages of 12 and 16. Ionescu’s original play tells the story of a small provincial town where people slowly start turning into Rhinocerus. The surrealistic play was created as a response to the sudden increase of Nazism during the events that proceeded World War II, and offers a very actual political discussion: the danger of mass movements and mobbing mentality. After the show we sit down with the kids and have the chance to hear their opinions and question, and it feels a little bit like that is the whole reason we do our job, to educate, bring a little magic and if possible a little something to think about. And that brings us to where we are now, Rhinoceros premiered on the 12th of January, on the 15th we started to work on the creation of Cinderella, and I had one week to learn Coco Chanel, both ballets by Peter Breuer. While Cinderella doesn’t premiere until March, Coco Chanel already had its premiere in January 2016, and we are taking it in a small Tour, with three shows in three different cities around Germany. For me the biggest change has to be not working in only one house, while always having a change of environment can be refreshing and energizing, I really miss knowing everyone and meeting people from different sections throughout the day, and of course I miss our canteen, if you don’t know it yet let me tell you: The Karlsruhe canteen is the best in the World, but I have to say the Landestheater is a good second run! The other thing I have come to realize is that work in a smaller house is a lot more intense in every sense of the word, a smaller ensemble means more work to all involved in order to keep up with the demand of the productions, its definitely what I like most about the change, although it is tiring, it feels great to be useful, and in my opinion, a dancers career is too short not to be danced to the fullest. It is essential to feel useful. Hopefully you continue to post.